There is a blog I follow called Talk2thetrees and the owner, Rachael is an incredibly talented artist. 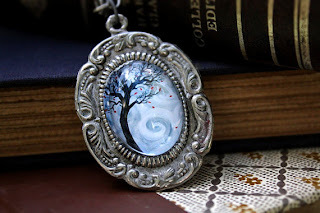 She sells her paintings on etsy and announced not long ago that she would be making necklaces and using some of the paintings she had created.. I just love her work and so I went ahead and bought a necklace which arrived yesterday. It is so lovely! I wore it today (to my last exam for the session, woohoo!) and I plan to wear it again tomorrow. It is so different and unique and didn't cost much either!